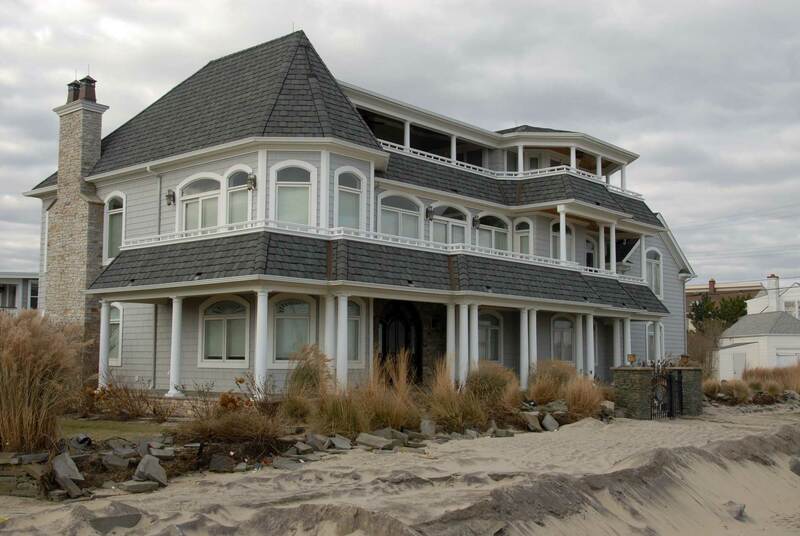 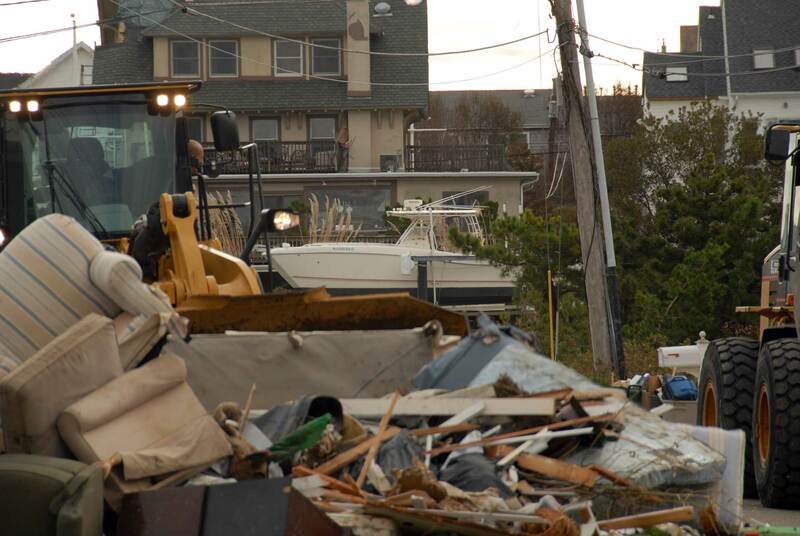 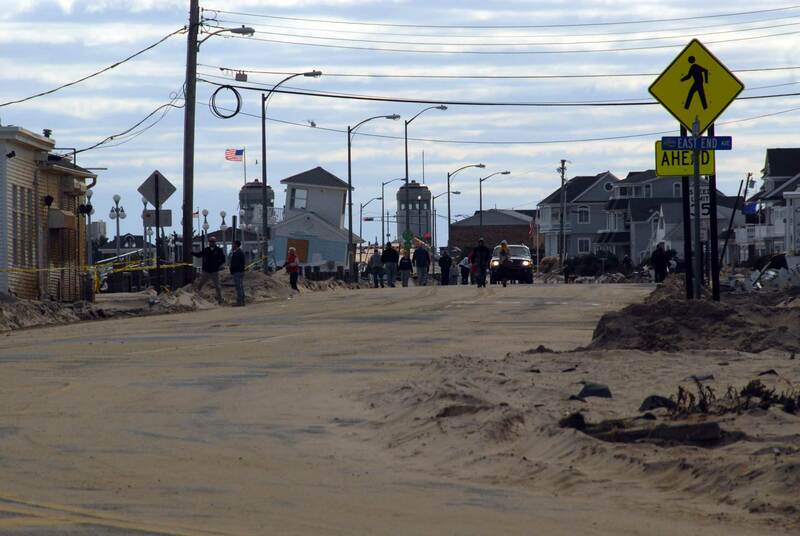 Bradley Beach has made great progress restoring the dunes which were destroyed during Hurricane Sandy. 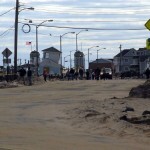 They’ve completed building fenced in areas filled with Christmas Trees on about (in my rough estimation) 30 – 40% of the length of the beach. 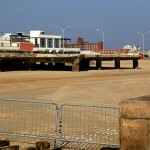 From what I’ve heard these will gradually be covered with sand and then planted with dune grass. 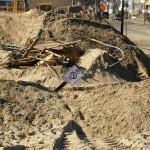 The roots from the dune grass will anchor themselves in the buried trees and create a fairly solid protective dune. 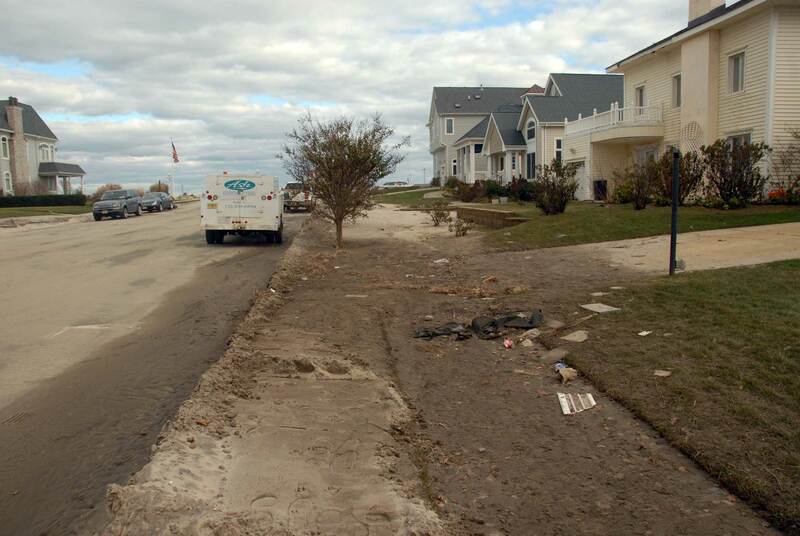 The original dunes were created this way after the ’92 storm and held through most of Sandy resulting in relatively minimal damage along Ocean Avenue. 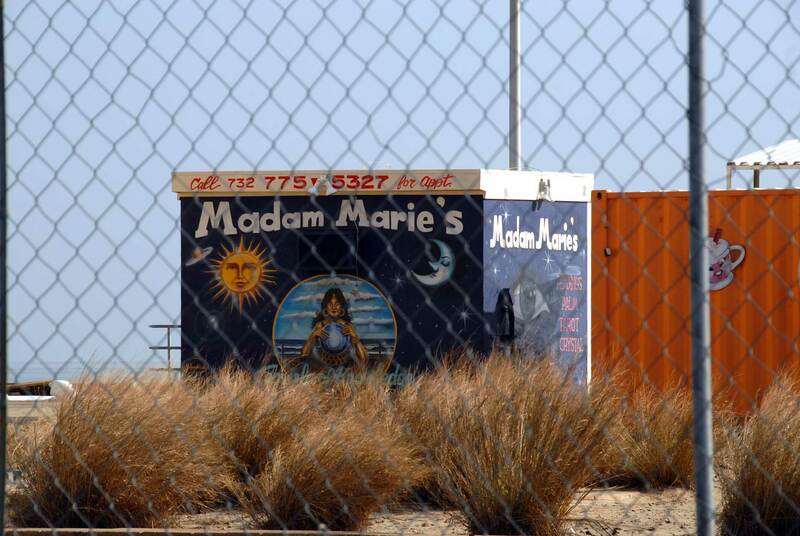 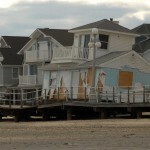 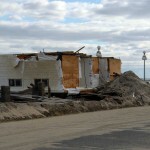 The town is fixing several of the buildings along the boardwalk which were damaged by the storm. 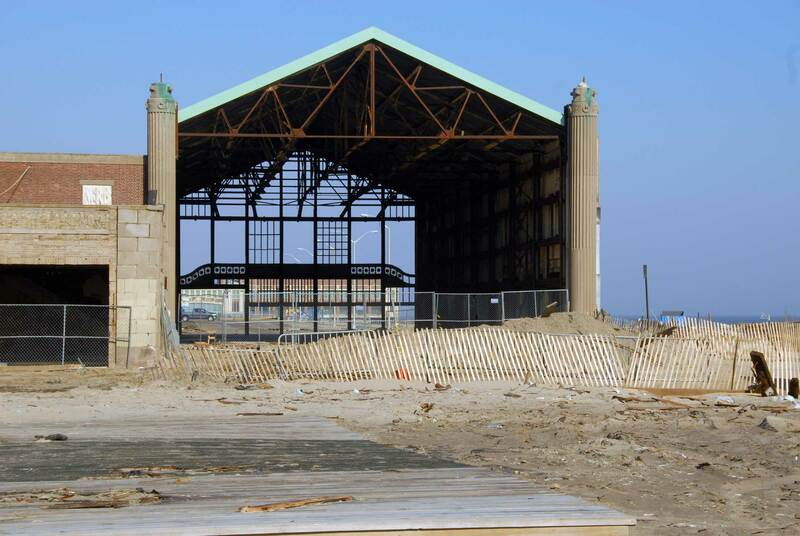 It looks like things will be in great shape for the opening of the 2013 summer season! 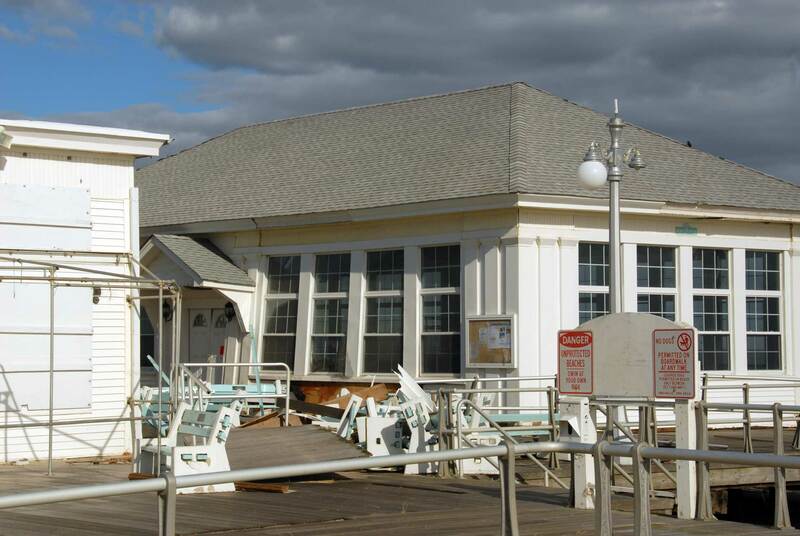 Come on down and visit us! 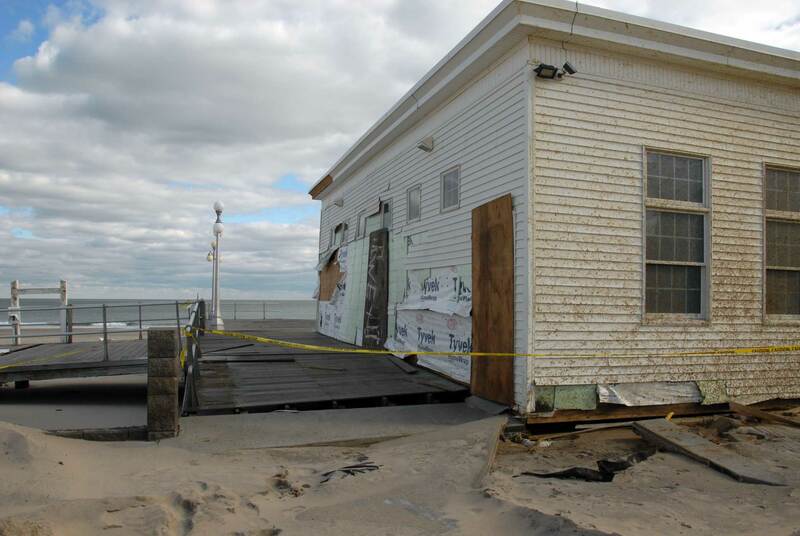 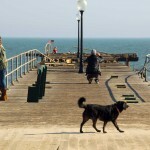 The was a lot of damage to the newly rebuilt boardwalk, the fishing pier and some structures along the ocean. 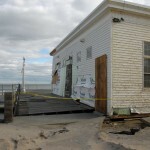 There appears to be only superficial damage to the buildings along Ocean Avenue, although part of the roof of the meeting hall was ripped off. 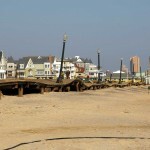 As with Bradley Beach, there was tremendous beach erosion which appears to have moved 5 or 6 feet of sand off the beach back up against the boardwalk and over Ocean Avenue. 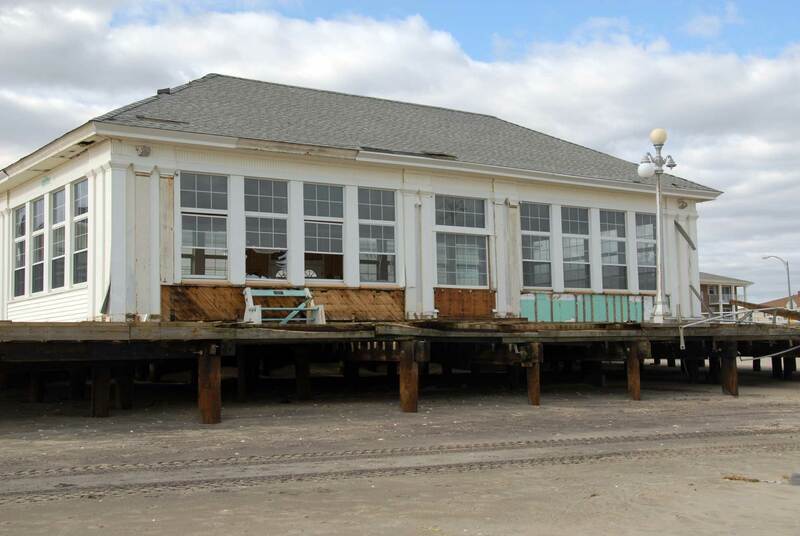 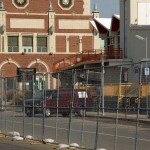 The white building on the ocean next to the Asbury Park Casino built in 1938, however, sustained substantial damage. 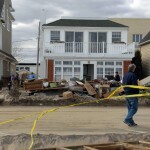 The rear portion of the building was completely destroyed. 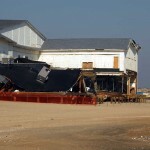 The family who owns it expressed a desire to rebuild. 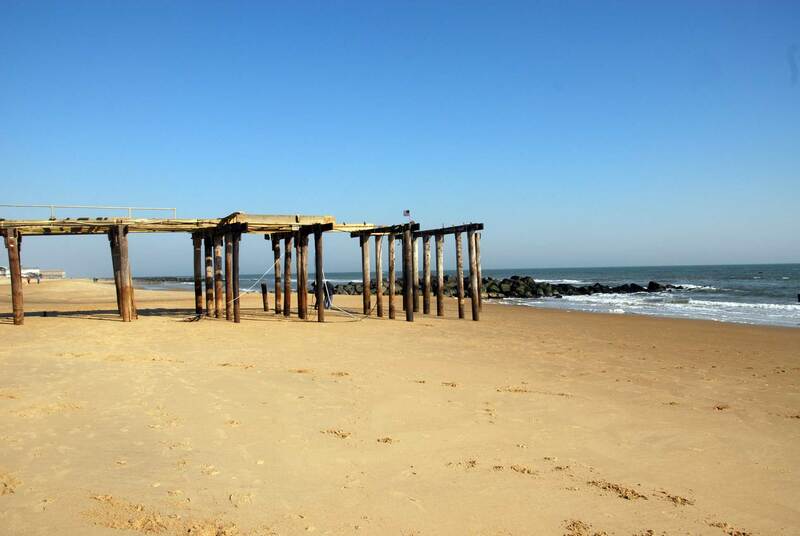 Pieces of the Ocean Grove Fishing Pier were seen scattered along the beach in Bradley Beach. 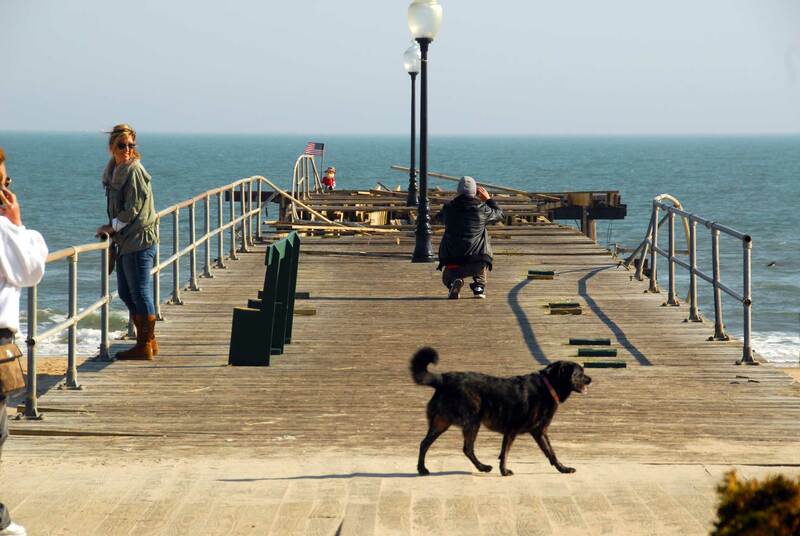 Many of the large pilings seem to have been responsible for the damage to some of the railings and stairways along Bradley’s boardwalk. 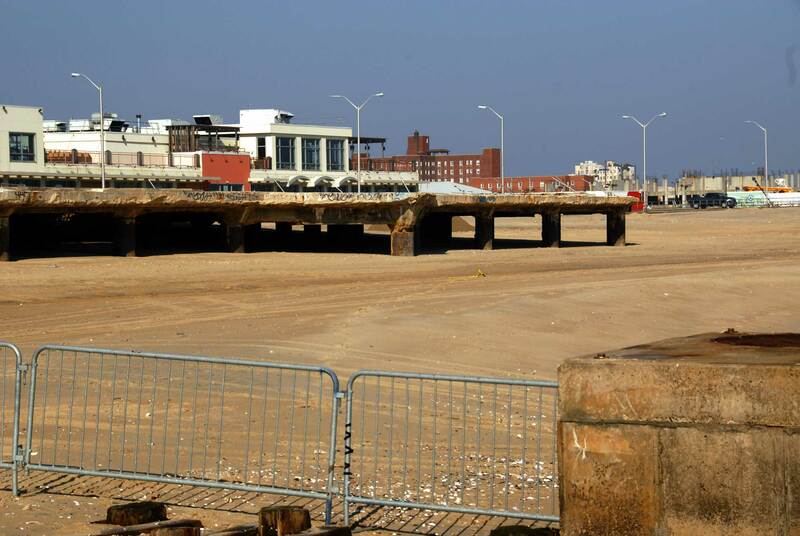 I found electrical fixtures and wiring still attached to pieces of the pier at the Newark Avenue beach entrance. 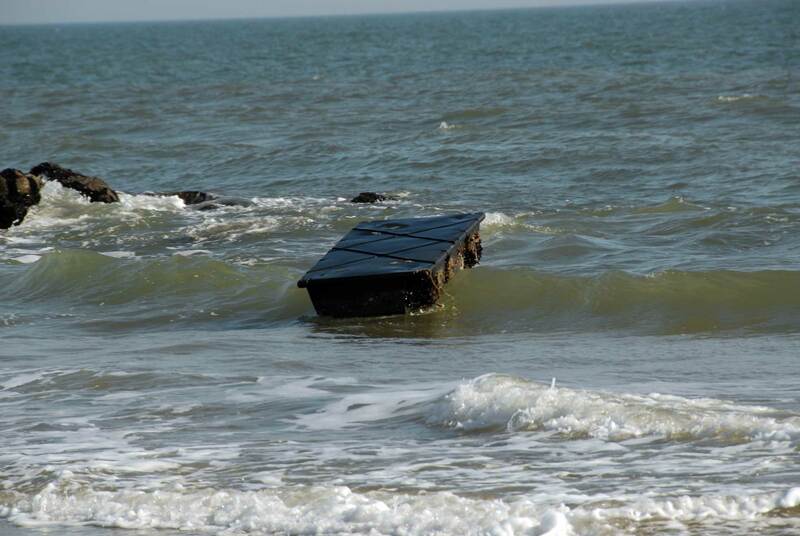 Presumably these were from the house which sat on the pier’s end. 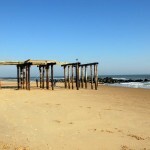 The end of the fishing pier is gone. 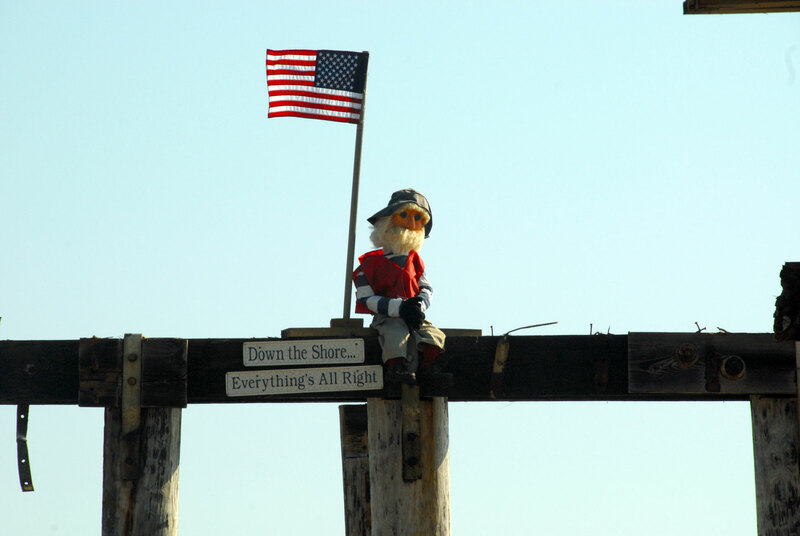 Ralph stands guard over what’s left of the pier. 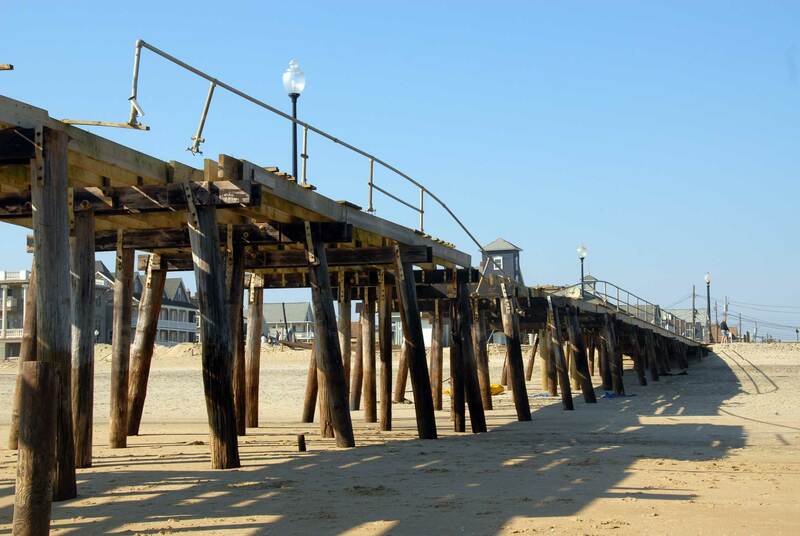 Damage to the pier looking away from the ocean. 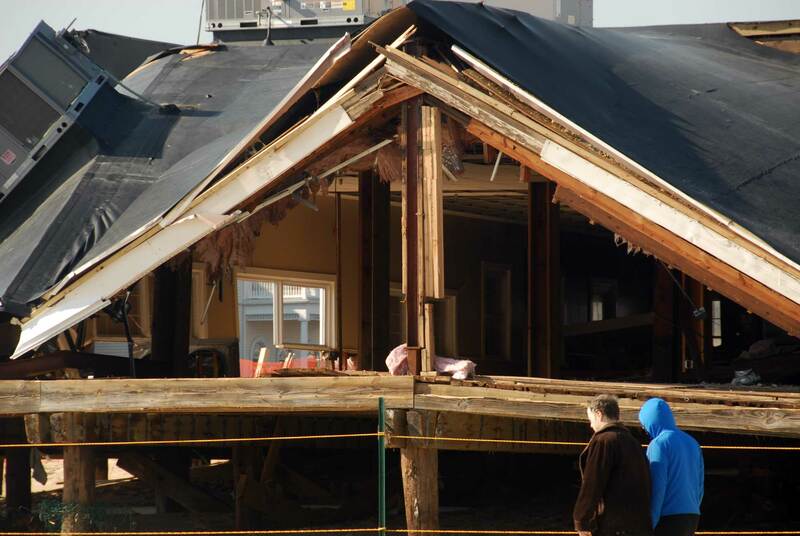 Damage to the rear of the Jones building. 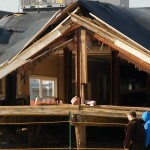 The rear portion of the old “Dorian’s Restaurant” collapsed. 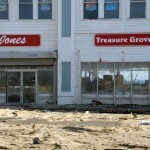 Stores severely damaged. 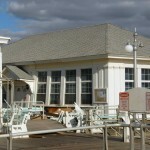 Ocean visible through the front windows. 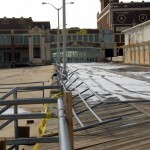 Much of the boardwalk badly damaged. 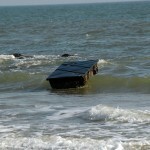 Piece of a dock floating by the jetty. 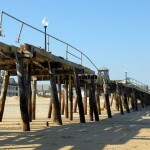 Looking out over the pier from the boardwalk. 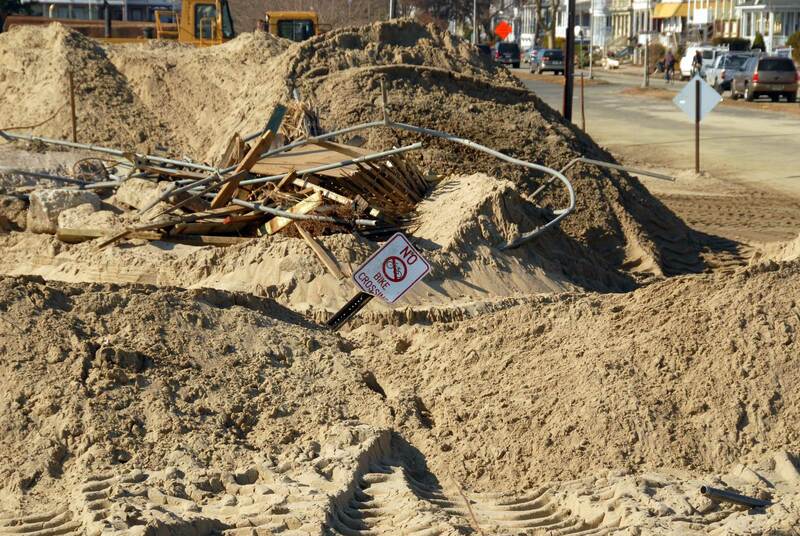 Not much danger of bicycles crossing here anymore. 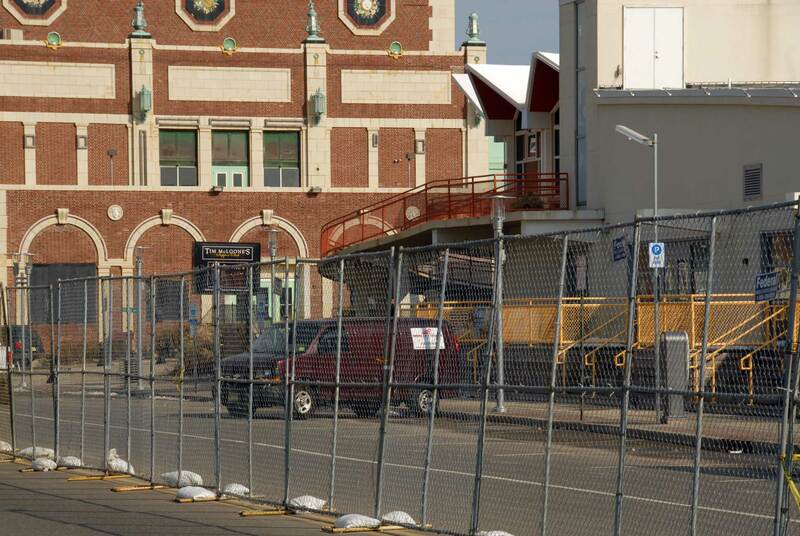 The entire boardwalk area in Asbury Park has been fenced in while the merchants in the ocean front stores are cleaning up their shops. 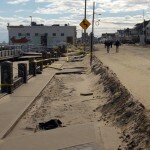 As with all the other towns, a tremendous amount of sand has been piled up against the boardwalk. 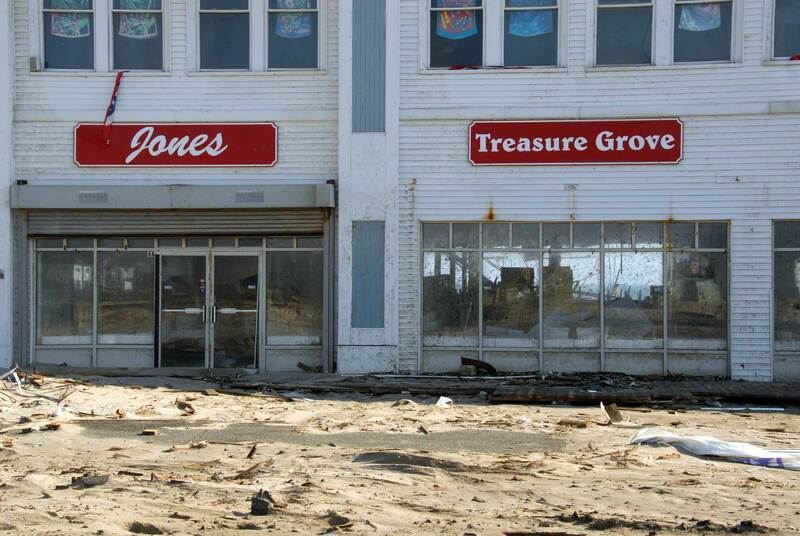 I was unable to see the front of any of those stores, but from the back it looks like most of them sustained a fair amount of water damage. 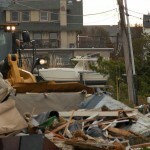 For what it’s worth, all the buildings in the area seem to be still standing. 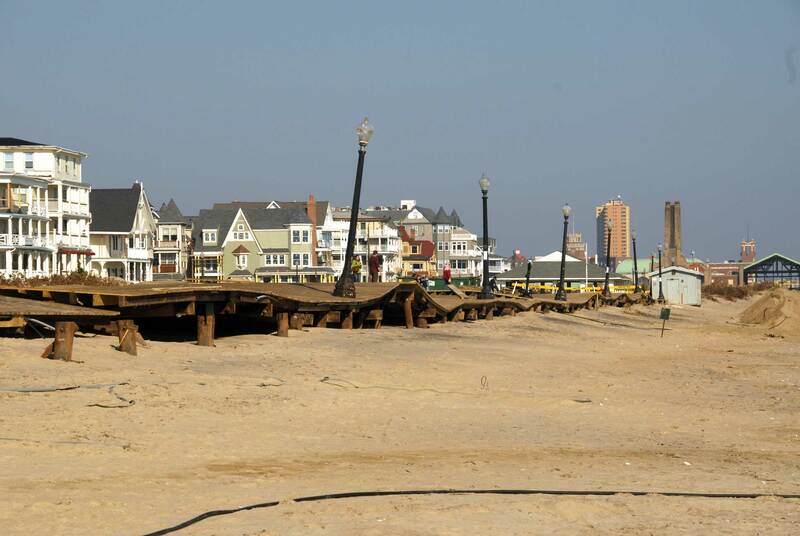 The boardwalk on the north side of Convention Hall is in reasonably good shape. 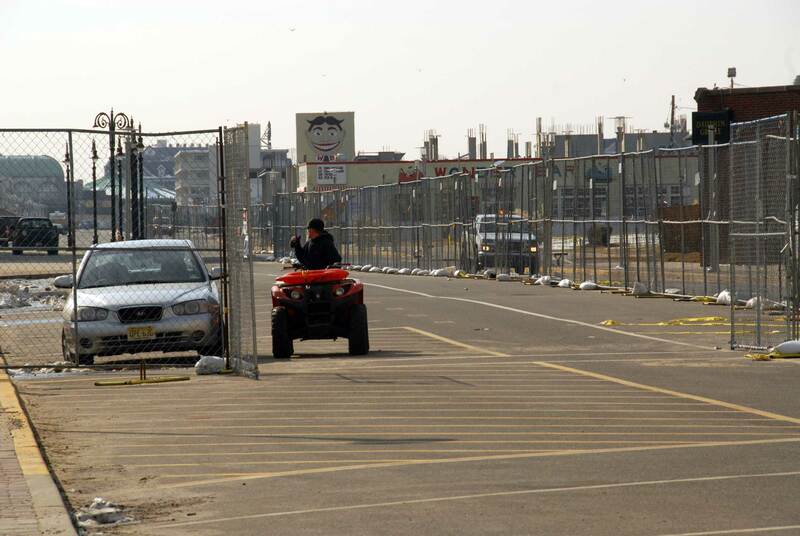 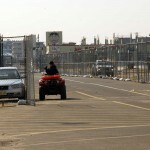 Ocean Avenue bisected with fence to protect damaged properties. 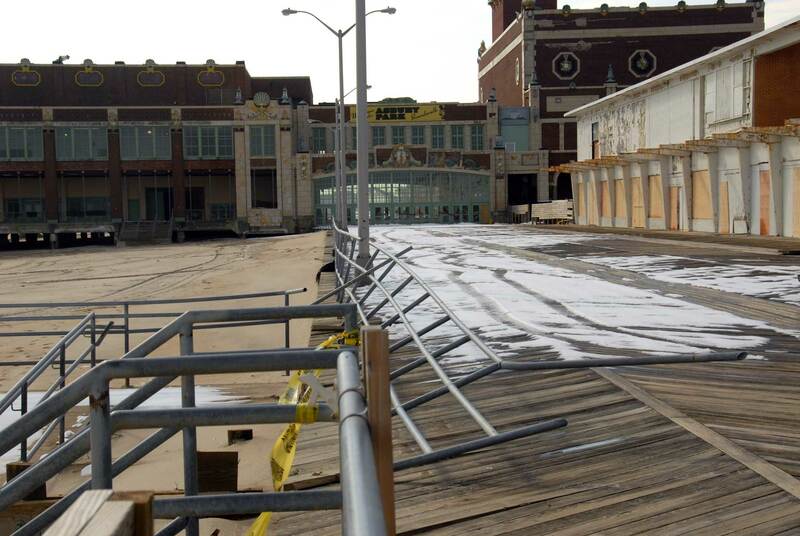 Boardwalk on North side of Convention Hall in relatively good shape. 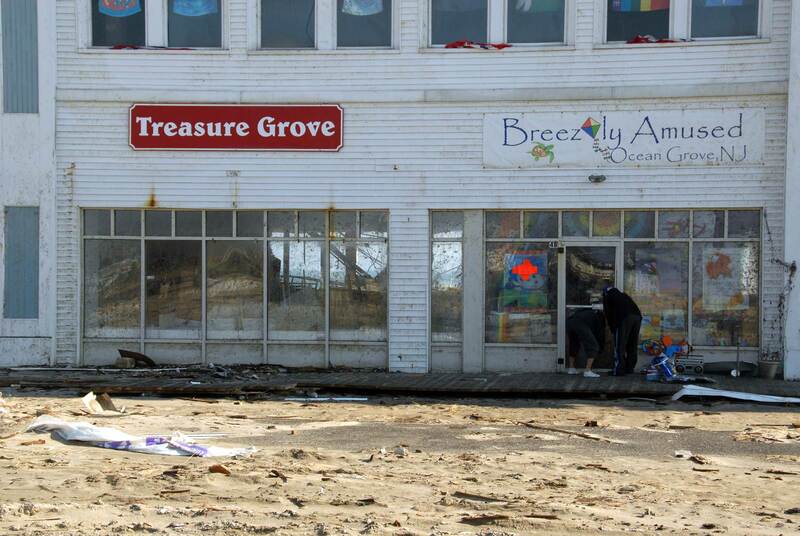 Avon by the Sea didn’t fare as well as Bradley Beach. 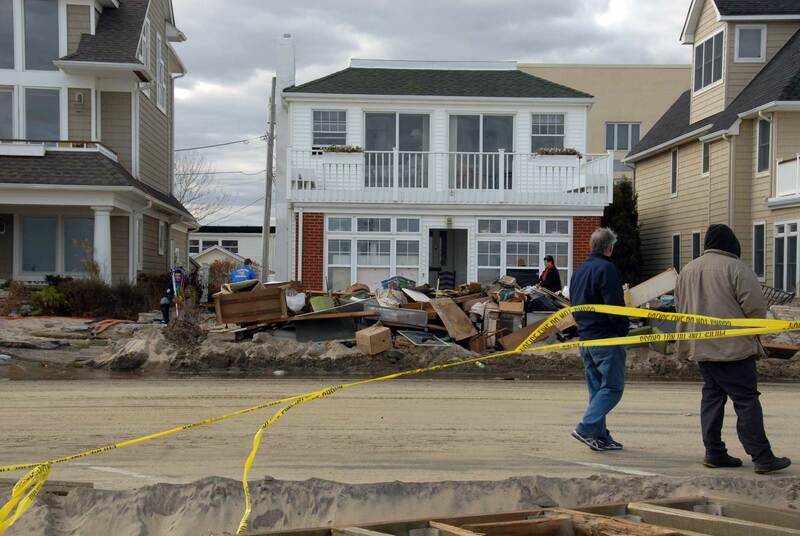 Water from the surge washed back a couple of blocks and seems to have flooded most of the houses on Ocean Avenue and in the first ocean block. 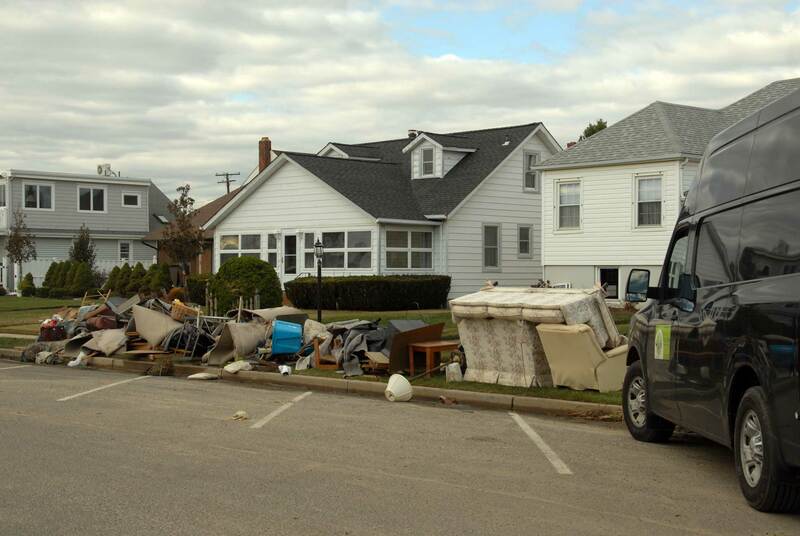 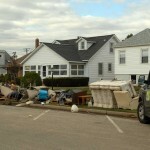 We saw a large number of people who had piled the much of the furniture from their first floor on the curb. 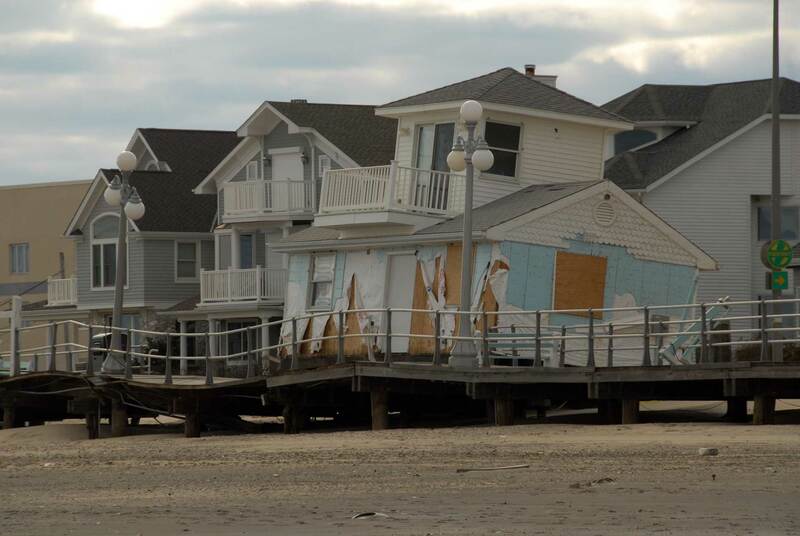 They suffered considerable damage to the boardwalk and buildings along the ocean. 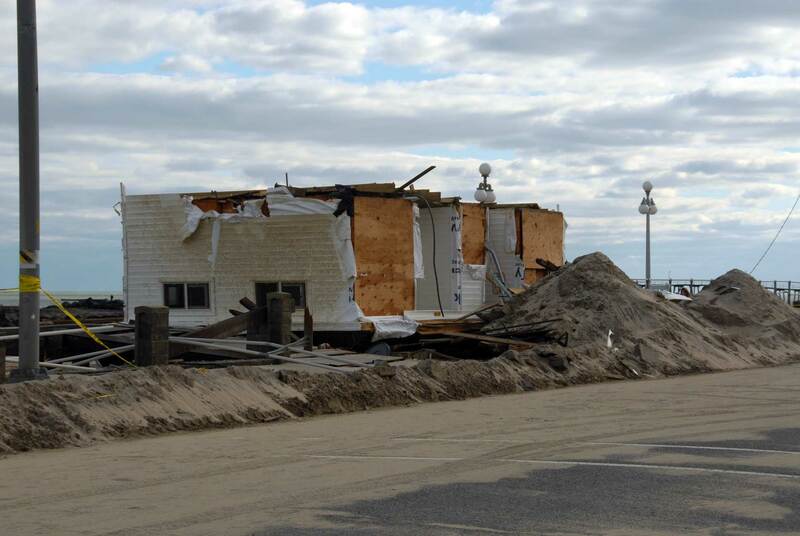 The pavilion on the North end of town was seriously damaged. 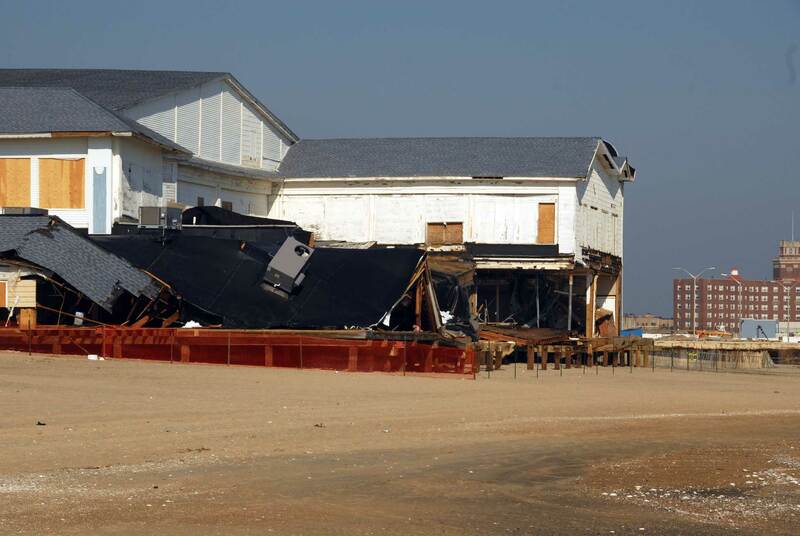 One of the buildings was sitting upside down on the boardwalk. 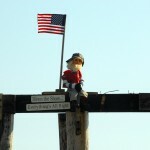 I’ve included some of the pictures I took. 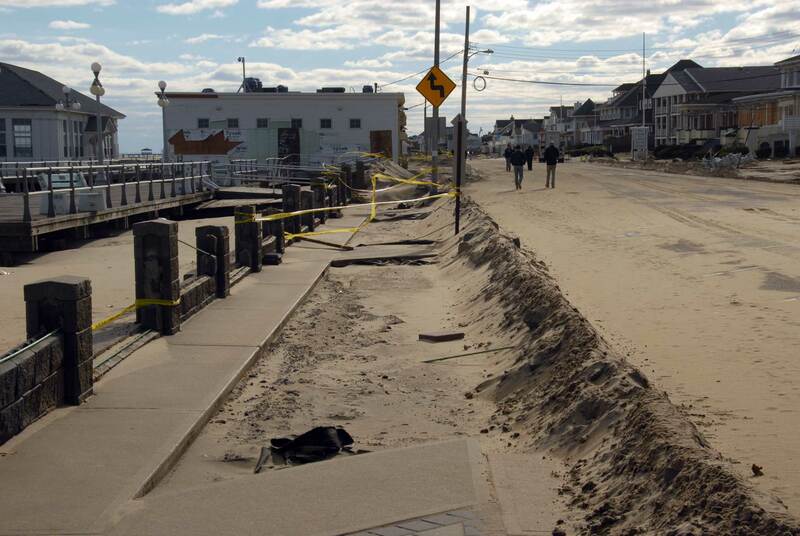 Boardwalk/sidewalk ripped up from Sandy surge. 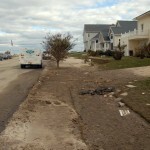 200 Ocean Avenue…stone wall in front is demolished.